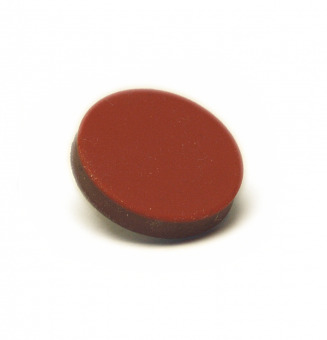 This is a Quart Resonance Pad (QRP) that fits Buffet Clarinet resonance keys. 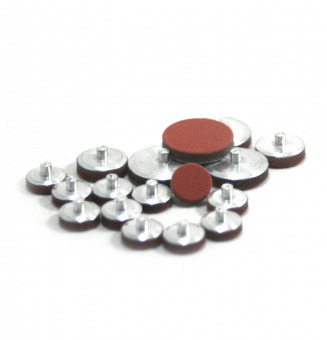 Quartz Resonance Pads (QRPs) are invented and made by Claríssono, Germany. 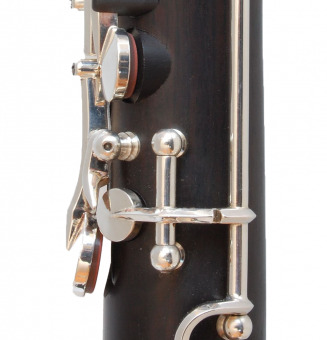 They are designed specifically to improve the tonal consistency and ensure an even level of resonance through the entire range of clarinets and oboes. The support layer or backing is made of aluminum. The use of this lightweight but rigid material guarantees the absolute evenness of the pad surface and allows for a simple repadding with all the typical adhesives like pad cement, hot glue, faux wax, or shellac. The damping layer consists of a highly elastic, transparent silicone. It absorbs and scatters the impact on the tone hole in a precisely calculated manner. 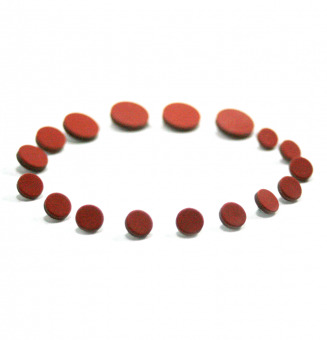 Surface layer is made of a specially designed red silicone including 24% of quartz powder. It not only provides an airtight seal but also reflects sound waves to a high degree due to its firmness. 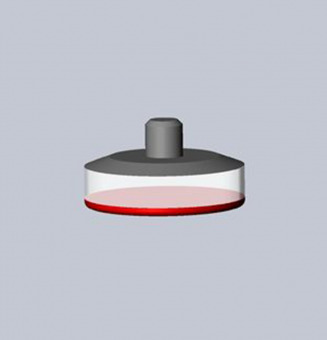 As a consequence of the described ideal reflection of sound waves, the red silicone surface is also responsible for the very good resonance properties of the QRPs. Furthermore, the addition of ferric oxide to the surface layer supports a warm and rich sound. The impact absorption is efficiently provided by the extremely flexible and soft transparent layer of silicone. More precisely, this material is responsible for two effects: the so called “phase compensation”, a necessary wave balancing process between the tone hole (vibrating body) and the key itself; and the minimization of destructive interference (unwanted cancellation of waves). That’s what a felt is supposed to do in a conventional pad. Unfortunately, the felt has not only the effect of phase compensation but also cancels all the frequencies almost entirely. That’s the reason why the QRPs have an immediate and very audible effect already when used only in the upper joint of an instrument. They provide the player with a more direct and much faster response. All the materials used in a QRP, in contrast to e.g. foamed silicone pads, are dimensionally absolutely stable and the pads are built to last for decades. You will not experience shrinkage due to age like with leather pads. There isn't going to be any noise or additional maintenance effort due to sticking pads - ever. You'll never hear the unpleasant sound an old leather pad makes when it hits the tone hole because it got dry and hard. And another major advantage: the QRPs don't need to be changed in the course of an overhaul but will do their job for years and years without wear or signs of aging, thus saving you a lot of money in the long run.